Randall and Hopkirk (Deceased): Mystery and Suspense on Television. 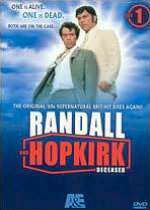 Randall and Hopkirk was a ITV1 series that aired over the 1969 / 1970 television season and consisted of 26 1-hour episodes. The first 13 episodes are on Set 1 of the DVD series. 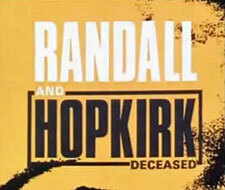 Jeff Randal (Mike Pratt) and Marty Hopkirk (Kenneth Cope) are private detectives when the series opens, but Marty is killed by a hit-and-run driver. After the funeral, Marty's ghost appears to tell him it was murder, not an accident. They investigate and the partnership continues with Randall and Hopkirk solving cases. The series aired in the US under the title My Partner the Ghost. A remake of the series aired in 2000 on BBC-1.